Dr. Million: Human lymphomas have been associated with many infectious agents including viruses (HCV, HIV) but also bacteria (Helicobacter pylori). Q fever, the infection by Coxiella burnetii, mainly acquired from domestic (cattle, sheep, goats but also dog and cats) or wild animals (deer), has been associated with many lymphoproliferative disorders (hyperlymphocytosis, mononucleosic syndrome). We observed a lymphoma developing in a patient followed up for Q fever that prompted us to investigate the association between the two diseases. In this study, we reported 11 cases of B-cell lymphoma developing after Coxiella burnetii primary-infection, we found an increased incidence of lymphoma in Q fever patients, particularly those with persistent focalized infection, and we detected the viable bacterium within lymphoma tissues. More specifically, we found that this bacterium infect the plasmacytoid dendritic cells (pDCs) in patients with C. burnetii-related lymphoma. This is particularly important since these cells are critical modulating their immune microenvironment including the natural antitumoral activity. Moreover, we found that peripheral blood mononuclear cells of these patients overproduce interleukin-10 even in the absence of the bacterium. This suggests that a persistent reprogramming of their immune cells have been triggered by the infection. Finally, we showed that these patients have very high levels of the anti-inflammatory Interleukin-10 in their serum, suggesting a systemic immune escape favoring the development of cancer. Coxiella burnetii is associated with an increased risk of lymphoma, its presence in the tumor microenvironment may favor lymphomagenesis. 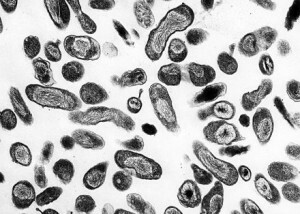 C. burnetii should be added to the list of bacteria that promote human B-cell non-Hodgkin lymphoma. Dr. Million: Based on the observations and results of our study, we believe that practicing clinicians should ask for a Coxiella burnetii serology for each patient diagnosed with a B-cell non-Hodgkin lymphoma (NHL). Practicing clinicians should also be aware of an increased risk of lymphoma in patients with Q fever (infected by Coxiella burnetii). Eventually, in patients with Q fever and unexplained elevated serology, a positron emission tomography should be performed. If a persistent lymphadenitis (> 1 month) is found clinically or by positron emission tomography, a lymph node biopsy should be discussed and abnormal lymph nodes should be monitored very carefully. Noteworthy, circulating B-cell lymphoma without lymphadenopathies (hairy cell leukemia, marginal zone lymphoma,…) could also be associated with Coxiella burnetii infection. In patients with B-cell NHL linked to Coxiella burnetii, antibiotics could be critical in the management of the disease and are likely to improve the prognosis. However, data are lacking to know if antibiotics alone are able to cure these patients. Further studies should clarify if antibiotics alone would be sufficient for early stage of Coxiella burnetii infection-related lymphoma. One patient of our study (the one diagnosed in Israel by Dr Michal DEKEL) did not show clinical lymphoma progression at one year with a prolonged combination of antibiotics (doxycycline plus hydroxychloroquine) without chemotherapy but his follow-up is ongoing. Moreover, we believe that new patients diagnosed both with lymphoma and C. burnetii infection should be referred to our WHO expert center for Q fever in order to evaluate the best therapeutic options based on the most exhaustive international cohort. This association should not be neglected anymore and its recognition will improve patient prognosis. Lymphoma has to be considered in patients with Q fever and lymphoid disorders, especially those with persistent focalized infections. Q fever has to be considered systematically in patients with lymphoid disorders, especially in endemic areas. Dr. Million: Future research should identify whether other cancer are associated with Coxiella burnetii infection. This could be investigated comparing incidence of these cancers in the Q fever population to the general population. All cancer associated with a positive Q fever serology should be tested for the presence of the bacterium in the tumor by fluorescence-based methods that are the most sensitive bacterial detection method to date (immunofluorescence and fluorescence in-situ hybridization). Future research in oncology and hematology should search actively and systematically for infectious pathogens as the triggering event of lymphoproliferative disorders including lymphoma but also other cancer; for instance Helicobacter pylori, previously associated with gastric carcinoma, has been only recently linked to cholangiocarcinoma. The significance of our findings overcomes the link between Q fever and B-cell NHL. First they argue against a stochastic process at play for oncogenesis. Secondly, they propose a completely new model for oncogenesis in which a bacterial infection of immune cells paralyzes the natural antitumoral immunity. This work paves the way for the discovery of new links between cancer and viral but also intracellular bacterial infection. This entry was posted in Author Interviews, Infections, Lymphoma by Marie Benz MD FAAD. Bookmark the permalink.